Lacquers plated by Gary Salstrom and pressed on 200-gram vinyl at Quality Record Pressings! RCA Living Stereo Reissue Series No. 2 - 25 newly-remastered classical mainstays! Analogue Productions' RCA Living Stereo Reissue Series No. 2, with 25 newly remastered mainstay classical albums, will delight and astound your ears with their clarity and warm, rich tone. As with our first highly-regarded LSC series, shortcomings of previous editions have been improved upon — from the mastering, to the LP pressing, to the sharp-looking glossy heavyweight Stoughton Printing tip-on jackets that faithfully duplicate the original artwork, "Living Stereo" logo, "Shaded Dog" label and all! Mastered by Ryan K. Smith at Sterling Sound from the original 2-track master tapes, cut at 33 1/3, and plated and pressed at Quality Record Pressings — makers of the world's finest-sounding vinyl LPs, — no other editions match these for the quietest 200-gram platters available. 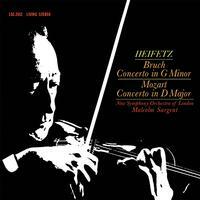 Violinist Jascha Heifetz, playing with the New Symphony Orchestra of London, conducted by Sir Malcolm Sargent. Heifetz was the leading figure among the extraordinary group of Russian Jews who dominated violin playing in the second and third quarters of the 20th century. As a technician he had no superior, and, of all the artists of his time and later, only two or three could even offer a challenge to his electrifying precision of execution. His diamond-point tone and quick vibrato afforded his playing a clarity of line that some felt was almost too perfect, even cold. Most conductors and other violinists — and audiences — felt differently and a Heifetz concert inevitably drew sell-out crowds.